The River Blackwater is one of Ireland’s largest rivers, extending some 160km from source to sea and draining in excess of 3,000km2. The river rises in the mountains of east Co. Kerry, traversing much of Co. Cork and west Co. Waterford, before entering the Celtic Sea at Youghal Bay, Co. Cork. The Upper Blackwater catchment occupies the northern parts of the Barony of Duhallow, in North Cork. The catchment consists of six sub-catchments, the Owenanare, the Dalua, the Glenlara, the Owenkeal, the Brogeen and the Allow. The River Blackwater and its tributaries are classed as Special Areas of Conservation (SAC) due to presence of many species and habitats of European importance. 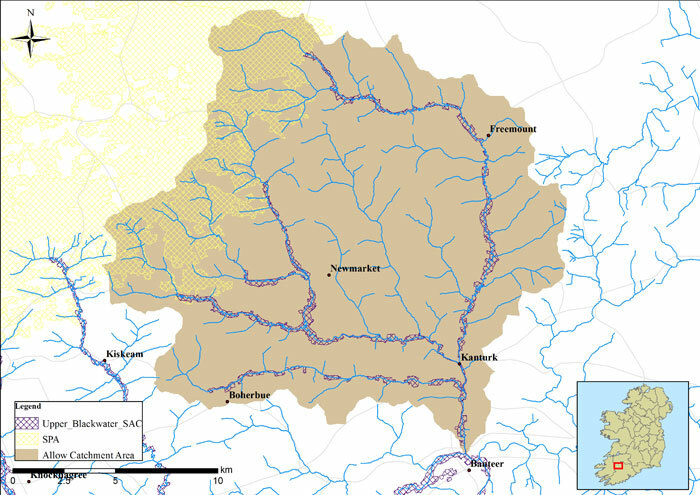 The River Allow and its tributaries are of particular importance as it provides habitat for a number of EU Habitats Directive Annex II listed species, the Freshwater Pearl Mussel (Margaritifera margaritifera), Salmon (Salmo salar) and Otter (Lutra lutra) , and the EU Birds Directive Annex I listed species, the Kingfisher (Alcedo atthis). The River Allow rises on the eastern flanks of the Mullaghareirk Mountains, flowing in an easterly direction for twelve kilometres before turning south at Freemount, where it continues through the town of Kanturk. In Kanturk town the Brogeen and Dalua rivers meet the River Allow. The River Allow eventually empties into the River Blackwater some 5km south of the town near the village of Banteer. The Allow River is included in the Blackwater River SAC, which has been designated partly on the basis of the presence of pearl mussel.